This is a nice Massive airframe structure joint which is solid metal and heavy and has clearly ripped and bent off in the impact of the crash from German Focke Wulf 190 number 789 shot down on the 27th August 1943 by French ace. This is joint is part of the main structure frame of the aircraft it is rusty but solid and it is 14 inches long by 3 inches wide and is VERY RARE to get such a large section from German Focke Wulf 190 in such a famous dog fight It comes with 2 x A5 information laminated sheets with photos of the pilots and a very nice relic from the very famous German fighter. German focke wulf 190 work number 789 of Stab JG26.The plane was in combat with RAF Spitfires this aircraft was shot down by RAF ace Pierre Closterman. The Pilot was Unteroffizier H.Krieg he was born 15/6/1920 he was killed when the aircraft was shot down by and crashed at St Pol Mardyck in Pas de Calais.The combat took place during Ramrod S.8 while the RAF Spitfires were escorting Flying Fortresses on the first daylight raid to Blockhaus d’Eperlecques which was a V2 rocket facility.This focke wulf 190 was shot down by French ace Pierre Clostermann it was his 4th victory the information below was the combat report given by Clostermann and describes how he shot down this focke wulf 190 and the dogfight that took place on the 27th August 1943. Commandant René Mouchotte DFC (21 August 1914 – 27 August 1943) was a pilot with the French air force who escaped from Vichy French–controlled Oran to join the Free French forces. Serving with RAF fighter command, he rose to command a fighter wing he took command of Number 341 squadron (Groupe de Chasse n° 3/2 "Alsace") with the Biggin Hill Wing he had 3 victories before being shot down and killed on 27 August 1943. It was fellow Free French pilot Pierre Clostermann who was last to hear from Mouchotte, and to record his impressions of this particular sortie, when they fell into a dogfight, heavily outnumbered by the Luftwaffe fighters.Suddenly I found myself in a relatively clear bit of sky. Spitfires and Focke-Wulfs swirled all round. Four vertical trails of heavy black smoke that hung in the air without dissipating marked the fatal trajectory of four aircraft, whose debris blazed on the ground, scattered in the meadows 27,000 feet below.Parachutes began to blossom on every side. Why no reinforcements? What was the controller waiting for? Twenty- four against 200 didn’t give us much chance.Paradoxically, we got along well for a time. There were far too many Focke-Wulfs, and they got in one another’s way. 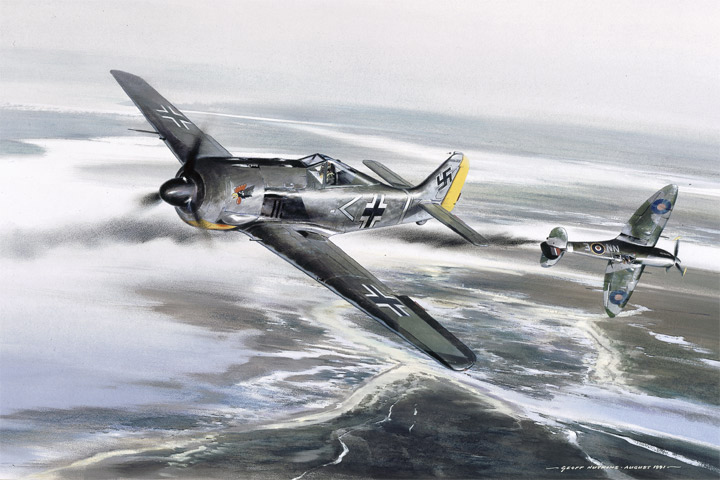 All the same, our retreat was cut off.What got me down was that, with so many Huns all round me, I wasn’t shooting a single one down.At last an opportunity presented itself… I attacked an Fw 190 from three-quarters rear. Just as I opened fire, he saw me and broke right, diving.I had made up my mind I’d get him. The air-speed indicator went up and up — 420, 430 mph.I was now gaining on him and went on firing at less than 100 yards. I distinguished the pilot’s face turning round…I pressed the multiple button and this time fired all my guns at once — two cannon and four machine guns — to have done with it. Two shells exploded simultaneously just behind the engine and the cockpit belched forth a cloud of black smoke. We were only 1,000 feet up. Roads and villages passed below our wings. Flames now gleamed through the smoke — the blow had been mortal. We went on down still further. A church steeple went by on a level with me….I had exhausted my ammunition…. But I had got him!At appalling speed the Focke-Wulf, still on its back, hit the ground and slid, scattering incandescent fragments everywhere… and crashed against a road bank in a dazzling shower of sparks.But I hadn’t finished yet: I had to get back to England. Quickly I pin-pointed my position: I was to the east of the forest bordering Saint Omer aireld. I began to breathe again, but not for long. Up there the battle still went on. The radio told me that Buiron had shot down a Hun.A few seconds later I heard, for the last time, Commandant Mouchotte’s voice calling:“I am alone!”What a hell of a fight for a wing leader – particularly the Biggin Hill leader — to find himself isolated!